Now we are at the point in the “learning to ride the bike” thing that many of us can sympathize with Gabe on. See, after a while he felt really good about gliding and being able to balance. He had gotten the hang of it and it began to feel like second nature for him. As a result, two things happened that brought his experience full circle and taught him some of the biggest lessons in life that he would ever learn. Let me share the first one with you today. One day, while I was outside doing yard work, he thought it would be a good idea to ride his bike. 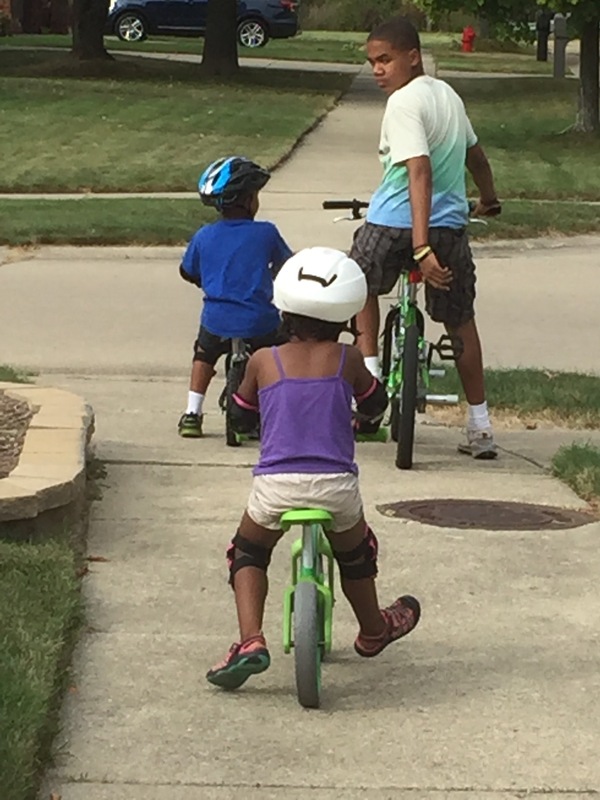 However, I noticed he came out of the garage (he and his little sister) and started down the drive way….with no gear on. I quickly yelled out to him (them), “Don’t you think you need to put on you helmet and guards?”. He replied, “No, I don’t need them anymore, I’m ok.” . To which his little sister chimed in, “yeah, we ok mom!”. Now, as a parent, I battled with going and forcing them to go and put on the protective gear, or just wait it out and let them learn this lesson on their own. I knew he thought more highly of himself then he should. I knew as a result, his little sister began to do the same. I could already see the accidents coming and how, and I also knew he wasn’t as good as he thought he was. But, I love them both and I knew that I could force them (and in some things I will), but today this lesson had to be learned. They sailed off down the drive way, down the side walk and not even 5 min later, I heard it! Yep……the weeping and gnashing of teeth 😭😩. He had fell off the bike to the ground and hurt himself. He came running to me and my arms were open. He had scraped his hand and his knee. Sissy was watching and as always loved to give her play by play highlights. I took them in and patched him up. After things were calm I explained to him (them) that this is why you wear the protective gear. Because you are going to fall sometimes and it isn’t always because you make a mistake, but because there are some objects in the way, or because you couldn’t see just how rocky or rough the road is in front. Their little minds seemed to understand and now there are very few times, if any, either of them are wanting to ride their bikes without the gear! In fact, they will sit and wait for me to help them put it on, where as before, they had no patience and wanted to go out NOW! The lesson was learned, the hard way 🤕. It is so with us as well. We want what we want, when we want it, how we want it and often times we don’t consider that God has places peramiters around us to protect us and keep us safe. In things like relationships, life goals, dreams and desires. He understands all these things are apart of our growth, but we must remain in our protective gear so that these things don’t hurt us or take us off track. If we refuse to remain covered by him, we put ourselves on a dangerous path and we will eventually, if not emediately get hurt. Often times we don’t realize this impacts the lives of those around us too, by them seeing the example we set. So, let’s remember before we venture out on the ride of life….get geared up! Let Christ cover you, and also protect you from the challenges that will come, and most times from our own foolish mistakes, and set a better example for those in our sphere of influence.